The Club is again producing a quarterly newsletter that can be viewed here above using the link. 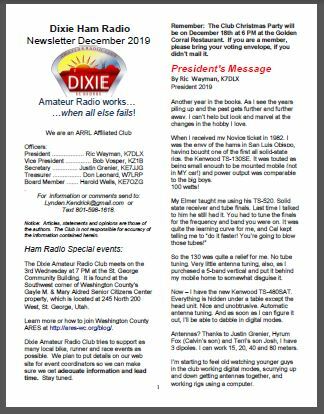 Our Newsletter Editor, Lyn Kendrick, KG7SXQ, is a volunteer, and is looking for short articles (50 to 150 words long) that we can put in the Clubs newsletters. We know that many of you can easily write these. ...Can you do CQ DXing with digital vhf. Will anyone answer you? ...Test, how far can you "get out" with a yagi on vhf. ...How you can use a CB SWR meter for VHF...is it worth the bother? ...What is a good radio to get started with HF? We are and will continue to also be soliciting advertising/sponsors who will be recognized in the Newsletter and at meetings. Please feel free to contact Lyn at lynden.kendrick@gmail.com or call him at 801-598-1618 if you would like to write something. You can also view an archive of past Club Newsletters by CLICKING HERE or on the "Newsletter Archive" button found at the bottom of any page on this web site.